Fox News reports: “President Donald Trump is set to make his second foreign trip as president. … Trump will visit Poland [departing Poland on July 5] before attending the two-day G-20 Summit in Germany on July 7. The following week, he’ll visit France for Bastille Day.” Trump is expected to meet with Russian President Vladimir Putin and other heads of state in Germany. Currently in St. Petersburg, Doctorow is a Brussels-based political analyst. He recently wrote the piece “U.S. Risks Wider War by Downing Syrian Plane” for Consortium News. 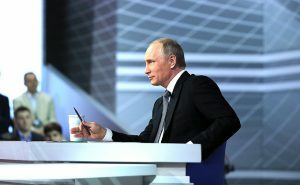 His latest book, Does Russia Have a Future? was published in August 2015. His forthcoming book, Does the United States Have a Future? will be published in September 2017. Petro is Silvia-Chandley Professor of Peace and Nonviolence at the University of Rhode Island. He was a Fulbright Scholar in Ukraine from 2013-14, and is the editor of Ukraine in Crisis. He just wrote the piece “The Real Ukrainian Solution is Federalism,” for The Nation. Bricmont is author of Humanitarian Imperialism: Using Human Rights to Sell War. He is also a mathematical and statistical physicist at the University of Louvain, and the co-author of Fashionable Nonsense: Postmodern Intellectuals’ Abuse of Science. He posts regularly on Facebook. He said today: “Trump is unpredictable partly because of his personality … partly because he clearly cannot do what he wants. The media and most of the establishment, including part of his party, try to force him to take an anti-Russian (and thus anti-Syrian) attitude that at least goes against what he promised during his campaign. On the other hand, he has always been anti-Iranian and anti-Palestinian (and anti-Cuban, anti-Bolivarian, anti-North Korean, etc.) and those lines fit with the establishment agenda so he is ‘allowed’ to pursue them. “Macron is unpredictable because he was never very clear in his campaign about what he wants to do. He wants to break the labor code and the unions and ‘give’ the workers on a silver platter to their bosses, that was always clear. But the foreign policy was never clear. Since he was overwhelmingly supported by the same ‘liberal’ media that supported Clinton in the U.S. and now oppose Trump, one would expect Macron to be a sort of a French Clinton, fiercely opposed to Russia and interventionist in the Middle East.